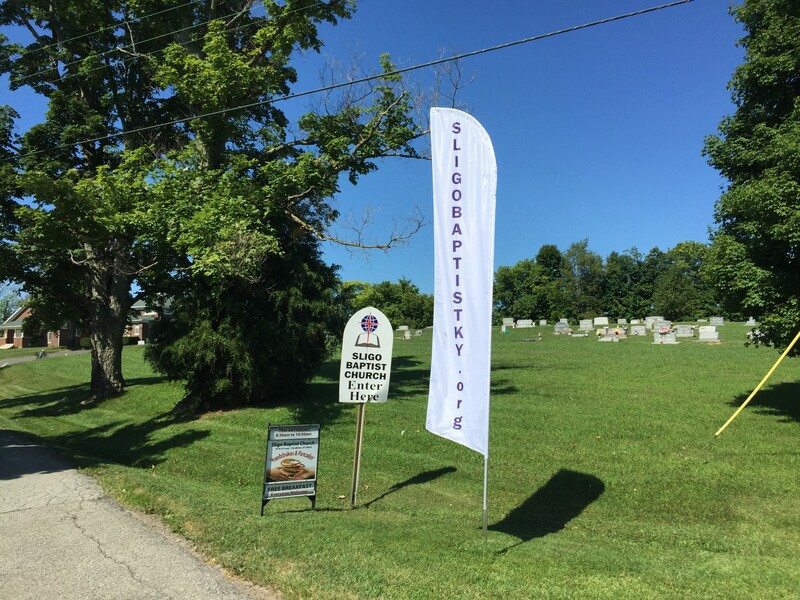 Sligo Baptist Church is located in Pendleton Kentucky at the corner of three Kentucky counties: Henry, Oldham and Trimble. The church campus is actually in these three different counties. Look for our feather flags at the ends of N 42 Loop, that’s where you turn to find your warm welcome waiting. If you are coming from the Louisville or LaGrange then you will be traveling north on either Interstate 71 or northeast on US highway 42 respectively. If you are on I-71 then take exit 28 which is the Pendleton/Sligo exit. From the ramp turn left onto Highway 153. This highway will end onto US 42 in a few miles. Turn right onto US 42 and go a few hundred feet and then turn left onto the North 42 Loop. The church campus will be on your left. If you are traveling on US 42 from Louisville or LaGrange, you will take US 42 all the way through Oldham county which is about 19 miles (coming from Louisville) and then go about 1 more mile where you will see the North 42 Loop and turn left. If you are coming from the Cincinnati or Bedford then you will be traveling south on either Interstate 71 or southwest on US highway 42 respectfully. If you are on I-71 then take exit 28 which is the Pendleton/Sligo exit. From the ramp turn right onto Highway 153. This highway will end onto US 42 in a few miles. Turn right onto US 42 and go a few hundred feet and then turn left onto the North 42 Loop. The church campus will be on your left. If you are traveling on US 42 from Bedford, you will take US 42 all the way through Trimble county and then go about 1 mile into Henry county where you will see the North 42 Loop and turn right.